Mindfulness is a Buddhist practice embraced by many psychologists and self-help "gurus." The practice has many beneficial psychological effects. However, mindfulness to increase happiness or reduce stress is somewhat different from the Buddhist practice of mindfulness. Right Mindfulness is part of the Buddha's Eightfold Path, which is the path to liberation or enlightenment. The traditional practice is more rigorous than what you may see described in many books and magazines. The historical Buddha taught that the practice of mindfulness has four foundations: Mindfulness of body (kayasati), of feelings or sensations (vedanasati), of mind or mental processes (cittasati), and of mental objects or qualities (dhammasati). This article will look at the third foundation, mindfulness of mind. The English word "mind" is used to mean different things. It's also used to translate more than one Sanskrit or Pali word with various meanings. So we need to clarify a bit. The Buddha's teachings on the Foundations of Mindfulness are found primarily in the Satipatthana Sutta of the Pali Tipitika (Majjhima Nikaya 10). In this particular canon of Buddhist scripture, three different Pali words are translated as "mind." One is manas, which is connected to volition. Manas also generates ideas and makes judgments. Another word is vinnana, sometimes translated as perception. Vinnana is the part of our mind that recognizes and identifies (see also "The Five Skandhas"). The word used in the Satipatthana Sutta is citta. Citta is a word worth exploring at length, but for now let's say it is consciousness or mental states. It is also sometimes rendered "heart-mind," because it is a quality of consciousness that is not limited to one's head. It is a consciousness that also engages emotions. The simplest way to explain contemplation of mind as mind is that it involves dispassionately observing yourself. Is there calmness, or agitation? Is there focus, or distraction? This is by no means an intellectual exercise. Form no ideas or opinions. Simply observe. Frame your observations as: "there is distraction" rather than "I am distracted." As with mindfulness of feelings, it's important to not make judgments. If you are meditating with sleepiness or dullness, for example, don't beat yourself up for not being more alert. Just observe that, right now, there is dullness. Observing mental states come and go, one sees how ephemeral they are. We begin to see patterns; how one thought tends to chase another. We become more intimate with ourselves. Although mindfulness of mind is most often associated with meditation, Thich Nhat Hanh advocates practicing mindfulness of mind every moment. In his book he wrote, "If you want to know your own mind, there is only one way: to observe and recognize everything about it. 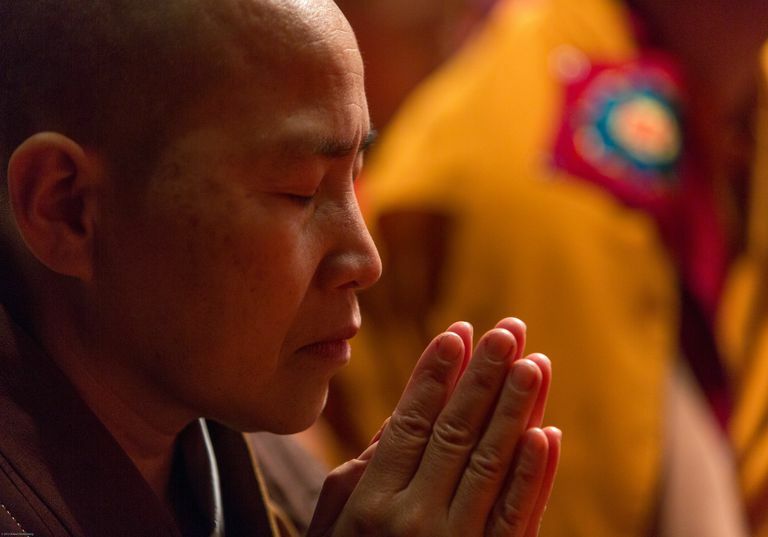 This must be done at all times, during your day-to-day life no less than during the hour of meditation." When a feeling or thought arises, your intention should not be to chase it away, even if by continuing to concentrate on the breath the feeling or thought passes naturally from the mind. The intention isn't to chase it away, hate it, worry about it, or be frightened by it. So what exactly should you be doing concerning such thoughts and feelings? Simply acknowledge their presence. For example, when a feeling of sadness arises, immediately recognize it: 'A feeling of sadness has just arisen in me.' If the feeling of sadness continues, continue to recognize 'A feeling of sadness is still in me.' If there is a thought like, "It's late but the neighbors are surely making a lot of noise," recognize that the thought has arisen. ... The essential thing is not to let any feeling or thought arise without recognizing it in mindfulness, like a palace guard who is aware of every face that passes through the front corridor.